We've been mixing Mike Conde's songs over the weekend. 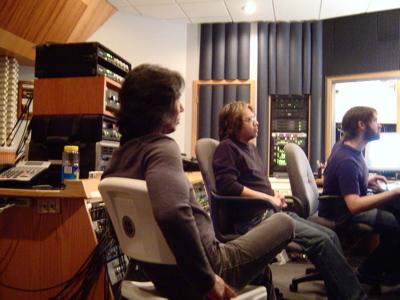 Steve and I are in the groove after finishing Anne Loo's incredible six songs--then hitting it hard with Mike and Rudy. Steve has really taken the lead on our mixing chores, which surprises me when I think about it. Steve's focus and talent are great, and my trust in him is implicit. 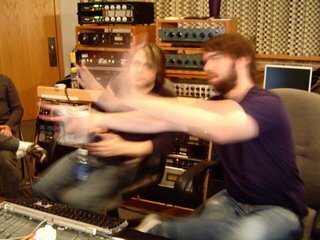 So I find myself gravitating more and more to the producer roll--less 'hands on' at the console than I ever have before. This is probably as it should be, but I do so enjoy mixing. Yesterday we mixed a song, Days, that started out life as a long rocker and has become a much more dramatic piece. At 7:38 it is a long song, but it doesn't seem like it. If Mike agrees, I'm going to post it here on the soundboard. Mike and Rudy have been a pleasure to work with. Steve has been the most amazing co-producer. All is good for our final day of mixing. I'll post more about Anne's mixes soon.